The McLuhan House Book Club is hosting Edmonton Eats co-author Tina Faiz and photographer Dong Kim on October 25, 2018. The event is free, but attendees are encouraged to bring a dish to share. Effing Seafoods now has a storefront located at 140, 44 Riel Drive in St. Albert. The grand opening is October 26, 2018. Knifewear’s Kevin Kent has authored The Knifenerd Guide to Japanese Knives. He’s launching the book in Edmonton with a party on November 2, 2018. Farm Fair returns to Northlands November 7-11, 2018. They’re hosting hands-on kitchen workshops again (free with gate admission) for ricotta and lemon cheese. I took part in a class to make the latter last year and found it to be one of the most value-oriented classes in town. The first of OEB’s two Edmonton locations is set to open on October 29, 2018. It is located in the Kelly Ramsey building downtown at 19174 100A Street. Congratulations to Chef Davina Moraiko of RGE RD who placed first at Canada’s Great Kitchen Party (formerly known as Gold Medal Plates). Chefs Serge Belair of the Shaw Conference Centre and Scott Downey of The Butternut Tree rounded out the podium. Black Box Hospitality was successful in its quest to crowdfund $100,000 towards their Gibbard Block project in Highlands. Sharon shared what to expect from the newly-opened Chef Hung Taiwanese Beef Noodle. Also from Sharon – she has enjoyed her visits to Buono. The Journal reviewed one of Alberta Avenue’s hidden gems – Mama Asha Cafe. Crystal wrote a post about her visit to Nomiya. Jonny sampled some of the beers in the taproom of Analog Brewing Company. The Alberta Gaming, Liquor, and Cannabis has made some further changes to liquor laws, including allowing bars and restaurants to create house-aged liquor products. A 12-year old boy from Edmonton will have his recipe for aloo gobi featured in a nationwide cookbook called Kid Food Nation later this fall. CBC published an article highlighting some of the challenges small farmers face regarding product distribution. Gone Green Farms, located near Pigeon Lake, donated 10,000kg of root vegetables to Edmonton and Calgary Food Banks last week. 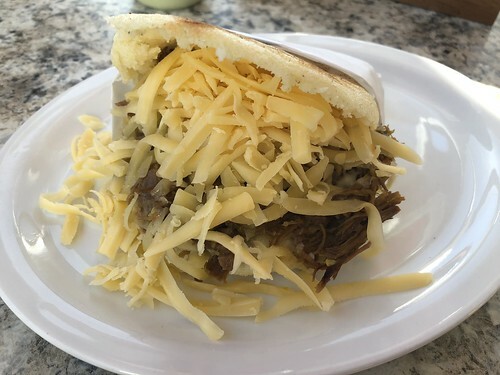 At some point I’ll have to try something other than the beef and gouda arepa at El Fogon, but until then, it’s always my go-to. Mack and I shared a gluttonous amount of food from the new Cosmic Pizza location downtown. It’s hard to find a deal as good as their $3.50 pizza slices anywhere else in the core, and Mack enjoyed his large donair featuring a very generous serving of meat. 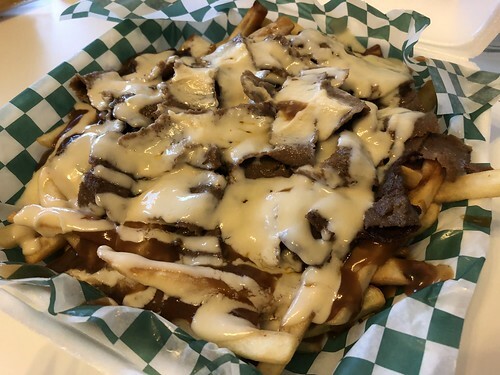 We also decided to split a donair poutine, but likely wouldn’t order it again as the fries just weren’t crispy.